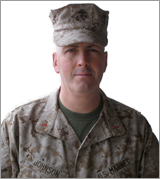 The Round Lake Area Exchange Club is please to announce that U.S. Marine, Chief Warrant Officer, Bruce Johnson is the Hometown Hero for October. Bruce is the founder of Mano a Mano Family Resource Center Foundation, CEO of NICASA and former Chief of Police for the Village of Round Lake Park Police Department. According to the Club’s Americanism Hometown Hero Project Chair, Sherry Ridge, “Bruce being deployed to Afghanistan earlier this year was a catalyst for this program and I am so happy that he is our first recipient of the Hanging with the Heroes” care package.” Each month a hero will be selected, the RLA Exchange Club and a sponsor help to fund the care package. Any and all military personnel serving overseas or in the USA from any of the Round Lake Areas, Hainesville, Fox Lake or Ingleside qualify for the program. Five minutes will get them registered. If you have a neighbor, family member, friend, employee, employer, etc. serving in the military please register them by going to www.rlaexchange.org/hero. We look forward to announcing the November Hometown Hero.